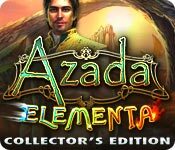 Journey to amazing worlds as the whimsical saga continues in Azada: Elementa! After its precious elements are stolen, Azada chooses you to find the elemental mages who can save this special world. But bad-guy Panoptes is waiting around every corner to stop you at any cost – or is he? Nothing in Azada is as it seems. During this trip to Azada, you’ll also get your very own cuddly sidekick. Earn critter coins you can use to dress him in a variety of fun outfits!